Sony has just announced the Xperia M2 Aqua with little fanfare, but then this is a fairly familiar phone. It's simply an Xperia M2 that you can dramatically throw in to the sea without frying it. So it's the return of a phone for which we gave a four star review, praising its impressive battery and flagship design - only this time it can be submerged up to 1.5 metres deep in fresh water for up to 30 minutes and it's dust proof too. The Sony Xperia M2 Aqua has a 1.2GHz quad-core processor, 1GB of RAM and a 4.8-inch 540 x 960 display with a pixel density of 230 pixels per inch. There's also 8GB of storage plus a microSD card slot, an 8MP main camera which can be used underwater, a 1.1MP front-facing one and a 2330 mAh battery, while the M2 Aqua also supports 4G and NFC. So waterproofing aside it's a distinctly mid-range phone, but that's okay if the price is right. Unfortunately Sony hasn't talked price yet, but we'd be surprised if it's much more than the Xperia M2. 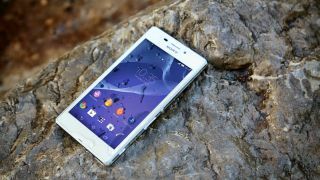 Hopefully we'll know for sure soon as the Sony Xperia M2 Aqua is set to launch from autumn 2014 in Europe, Asia Pacific and Latin America. Sony's flagship Xperia Z2 is water resistant too.